Police in Michigan's Sheridan Township were quick to pull over the driver of a Pontiac Sunfire. Not because said driver was drunk, not because other motorists saw the driver waving a gun, not even because the car in question was a Pontiac Sunfire. No, the police responded because the driver was seven years old. The boy's mother, an early candidate for Mom of the Year, decided to take a nap in the passenger seat and let her kid take the wheel. After a 20-mile jaunt, the cops caught up with the young wheelman, putting an end to his early driving career. He reportedly hit speeds of 50 miles per hour while the fuzz were in pursuit. 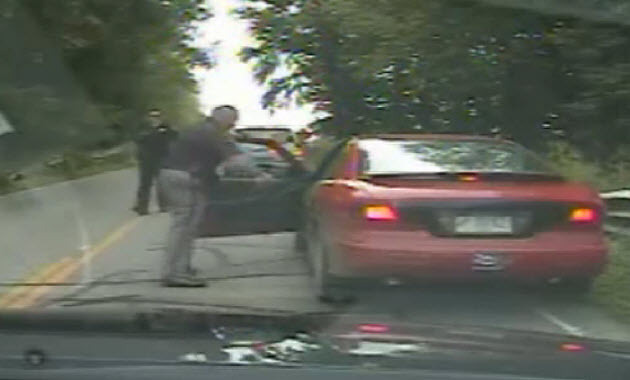 Click past the jump for dash-cam footage showing the tail end of the escapade. video at both source links. I think the kid has good taste in cars IMO. The boy's mother, an early candidate for Mom of the Year, decided to take a nap in the passenger seat and let her kid take the wheel.